PERFORMANCE As we know, the car of many customers' dreams is a truck. And project pickups, Jeeps and related machines show just how far the market has come, with towering builds of might, muscle and meticulous craftsmanship rising high above the crowd. 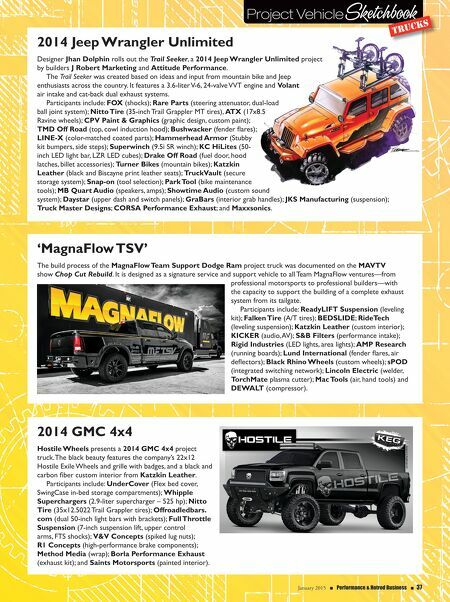 As part of our trucks coverage this month, here's a look at some of the latest and greatest projects that incorporate four- wheel drive, off-road style and the latest aftermarket touches into a go-anywhere build people can't help but look up to. Sketchbook Project Vehicle Above the crowd. 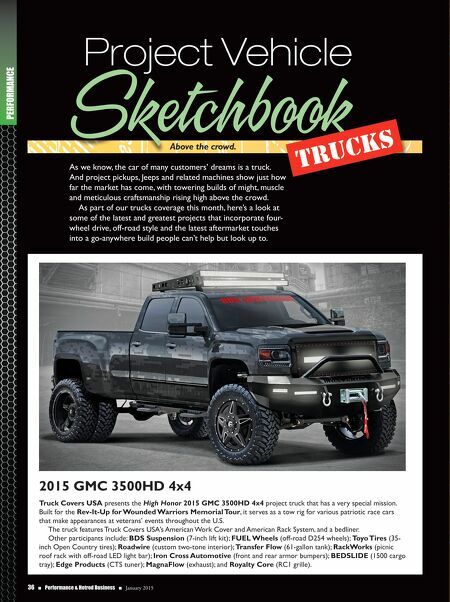 TRUCKS 36 n Performance & Hotrod Business n January 2015 2015 GMC 3500HD 4x4 Truck Covers USA presents the High Honor 2015 GMC 3500HD 4x4 project truck that has a very special mission. Built for the Rev-It-Up for Wounded Warriors Memorial Tour, it serves as a tow rig for various patriotic race cars that make appearances at veterans' events throughout the U.S. The truck features Truck Covers USA's American Work Cover and American Rack System, and a bedliner. Other participants include: BDS Suspension (7-inch lift kit); FUEL Wheels (off-road D254 wheels); Toyo Tires (35- inch Open Country tires); Roadwire (custom two-tone interior); Transfer Flow (61-gallon tank); RackWorks (picnic roof rack with off-road LED light bar); Iron Cross Automotive (front and rear armor bumpers); BEDSLIDE (1500 cargo tray); Edge Products (CTS tuner); MagnaFlow (exhaust); and Royalty Core (RC1 grille).